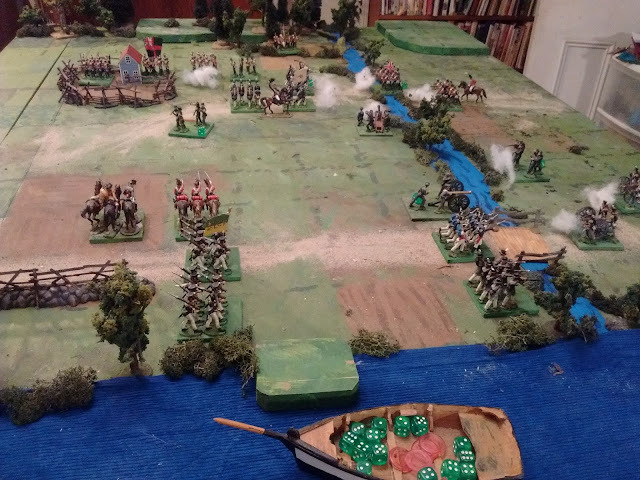 Today I made time to sit down and review the current state of my War of 1812 plans and figure out where I want to go and what my vague urge for "more" meant. I was soon reminded that many elements of the 1812 British army cheerfully serve the Red Queen in Atlantica and that it would really help if the two used the same organization and rules. After much reviewing of past blog battlereports, my current preferences, and a good look at organization, basing and rules trials over the last five years, I think I have it figured out. 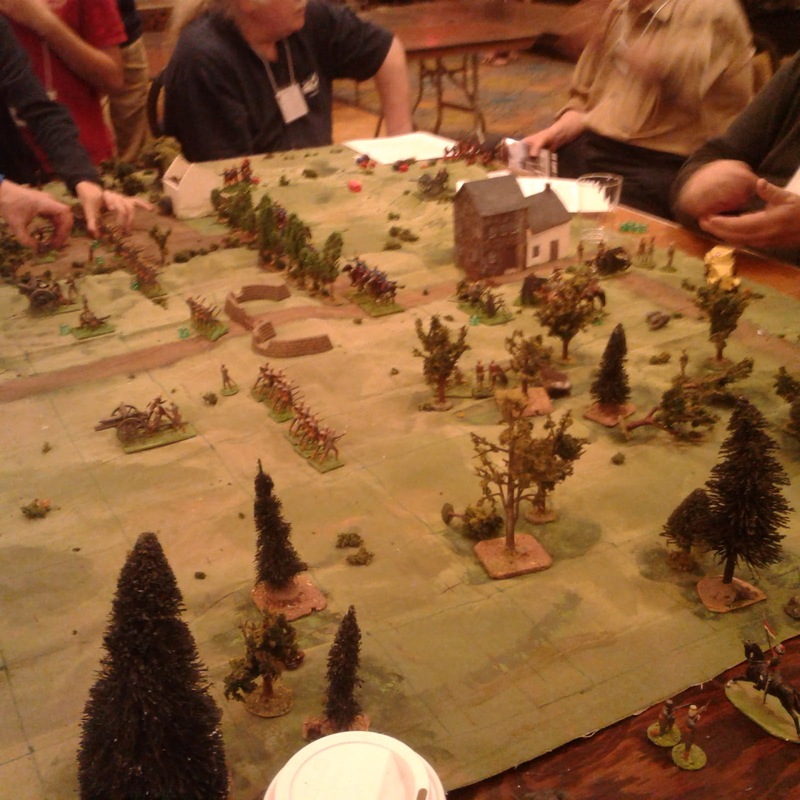 War of 1812 Square Brigadier Game New Year's Eve 2016. 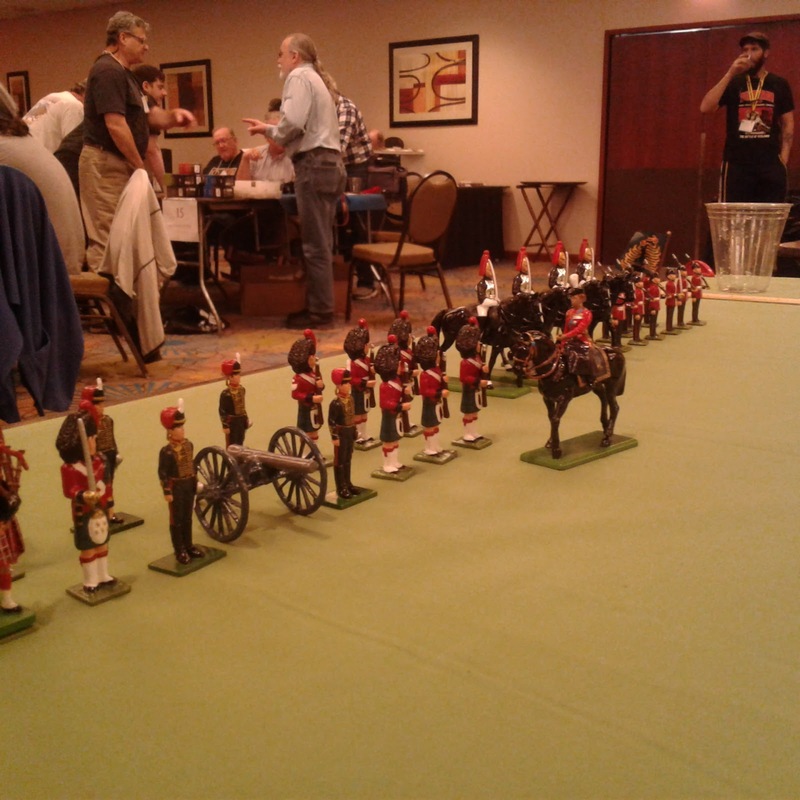 To start with, "more" mostly meant units with more staying power than at the present but also a game where units were close to the old 20 figure Featherstonian regiments or Charge! companies. 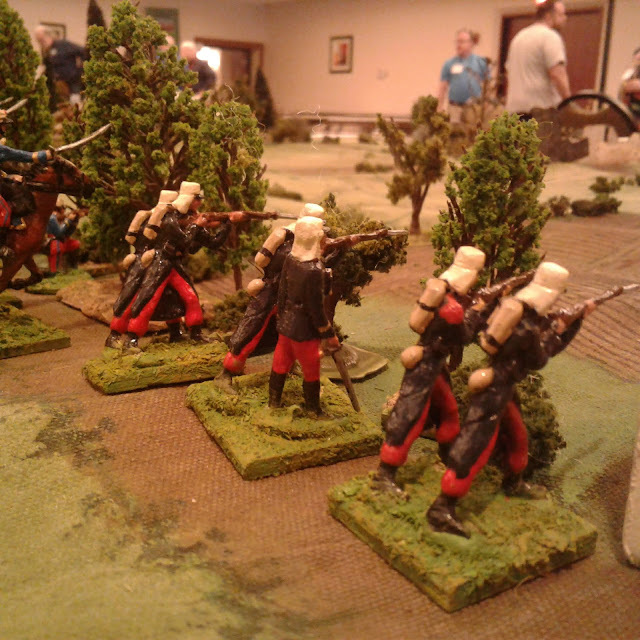 It also means the flexibility to break line infantry battalions into at least two detachments. 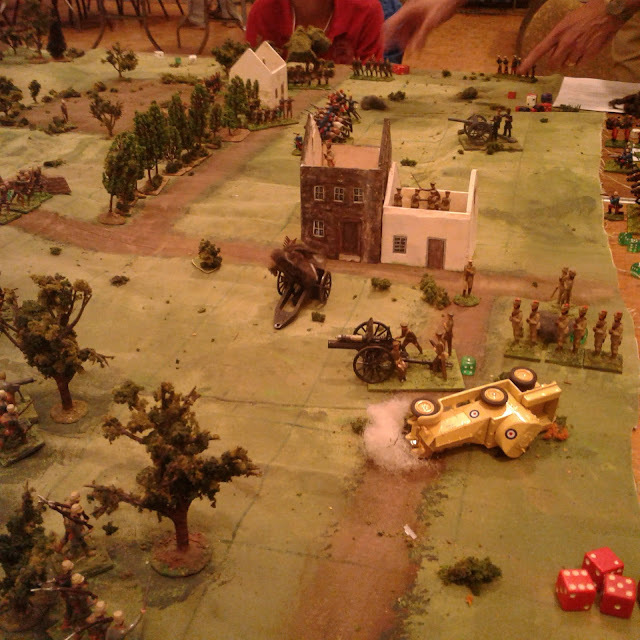 A Square Brigadier game from July 2016 where each battalion was represented by 2 separate units. Another shot of that end of 2016 Square Brigadier game. Last year I decided to experiment with different basing and organization for these two collections for reasons that escape me now but probably had to do with making them "different" as an excuse to paint more figures. The evidence suggestions that I don't actually NEED a reason to paint more so I'll quietly drop that part and put everyone back on 60mm bases with 2 to a unit. What this looks like in Atlantica at present but with improvised terrain. 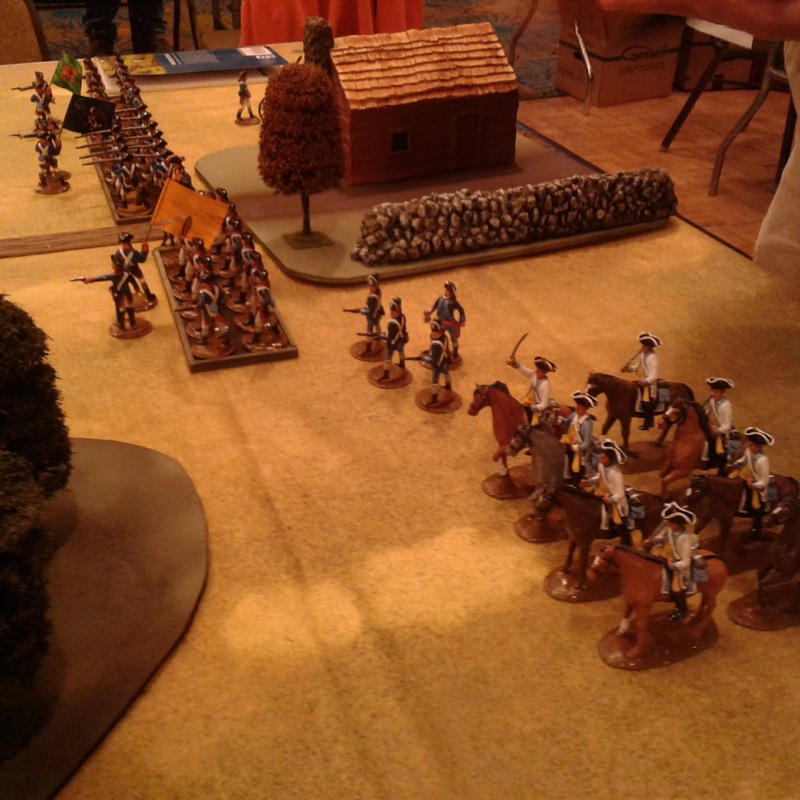 I also spent time brushing up the existing 1812 Variant of the Square Brigadier rules but they aren't ready to go yet. Hopefully I'll get that finished by the weekend and get a game on. As often happens I am back from my trip with a head full of ideas. This doesn't involve any new periods but it does involve some new moulds, lots of painting, a shift in approach to some of my periods meaning new or revised rules and a partial return to larger units which means infrastructure work as well. First Hurdle. My plan calls for each part of my collection to offer a different gaming experience but old habits coax me to share a good idea until everything blend together. Last summer I began the fight to restore the differences again and give myself a functional, more traditional feeling horse and musket game. 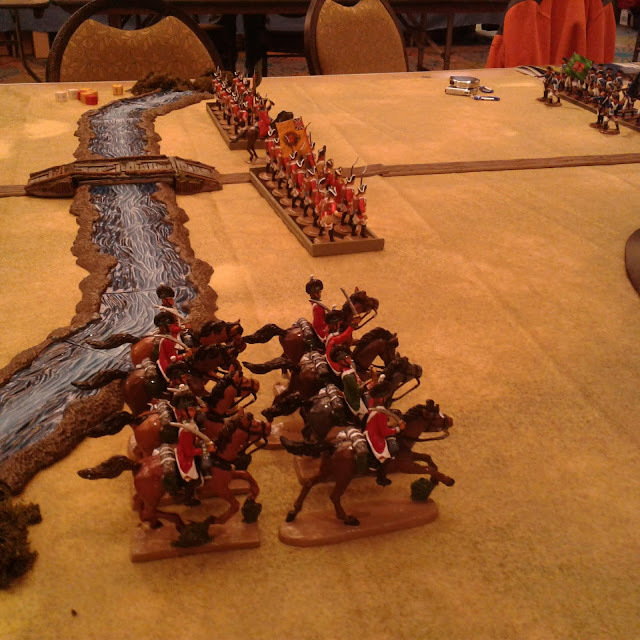 One part of that is going to be the overlapping War of 1812 and the overlapping, non-historical, Red Queen vs the Brethren campaign. A call for a return to bigger armies means that, I'm going to need more men! I started sculpting a new US infantryman in early shako a few years ago and finished him, ready for casting last summer. He got pushed out of the way by the 20thC but it is time for my first new liquid RTV mould in a lonnnnngg time followed by a new US battalion. At the same time, I finally have two dozen Scruby "natives" and "Boxers" which will be joining the Brethren once painted. While the new figures are being done and work continues on reorganizing and rebasing my old 1812-1840 figures, I will revise either MacDuff or Hearts of Tin to suit what's in my head. Expect a game by early June at the latest. The Turks are coming! The Turks are coming! 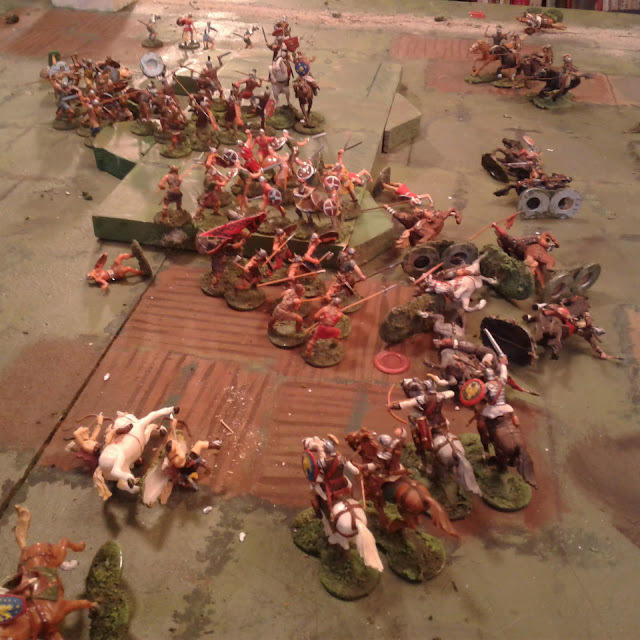 Second Hurdle: Rob and I have agreed to do a 16thC Turkish vs Imperial game next year if I can get the Turks done. 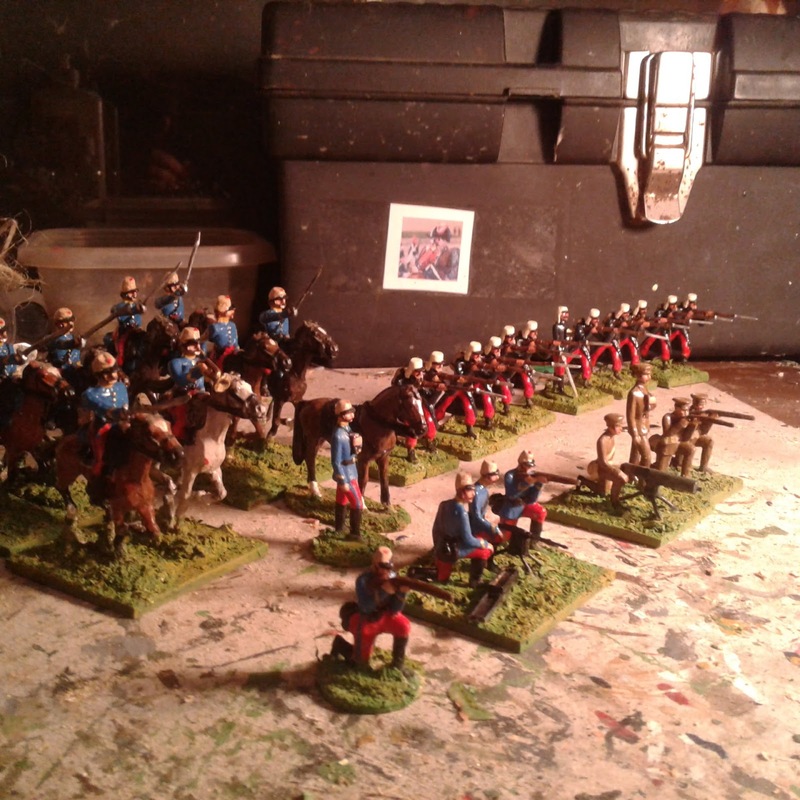 I do have some Turks already and some Drabant Poles and Russians which will be pressed into service as some form of Balkan levies and some of my Elastolin Huns can be pressed into service as Tatars but I need Akiniji and Jannisaries. 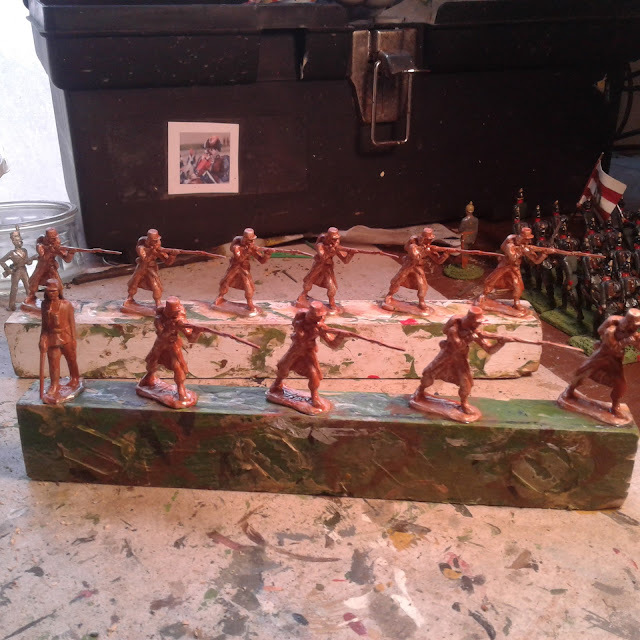 I'll tackle sculpting a Jannisary first and then do a cavalryman to fit the Zinnbrigade horse molds, especially the Hussar horse with large, pointed shabraque. 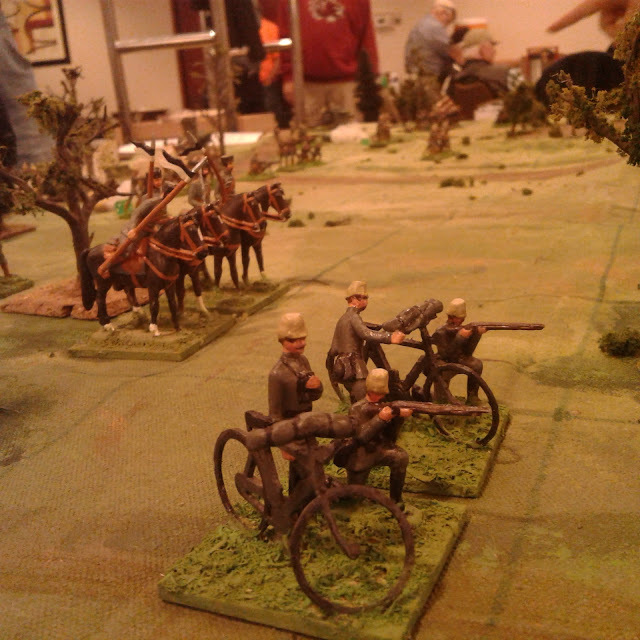 I intend to have a small Imperial-Turkish game on the table in time for my birthday in late July. Third Hurdle. My room is still a mess! The table is only a few scraps of plywood cobbled together shakily so building a proper table is a top priority, maybe just a little bigger. Building more shelves and storage for the larger armies is also a high priority. Ideally I want things done by the end of June. Just got to draw some plans, find some spare cash for materials, and do the work. or these (New rules already written) or any of my collections. Lots more ideas bubbling in my head so we'll see what surfaces. This sudden, unexpected, WW1 game seems to have been with me almost constantly for months now and I'm looking forward to "changing horses" for a while. However, I plan to revisit the early 20th Century again before too long and have to write up a full set of rules to support the existing two-sides-of-a page quick reference. I will need to remember the observations that follow when I do! The allies deployed for the first game. It really helps having someone else play your game. Always interesting to see where the rules work the way you planned and where they don't, where others pick up things as you intended and where they either don't 'get' something or see things that you had missed, whether that is good or bad. Its also interesting to see what sort of tactics and plans others try and how they interface with the rules, scenario and other players. 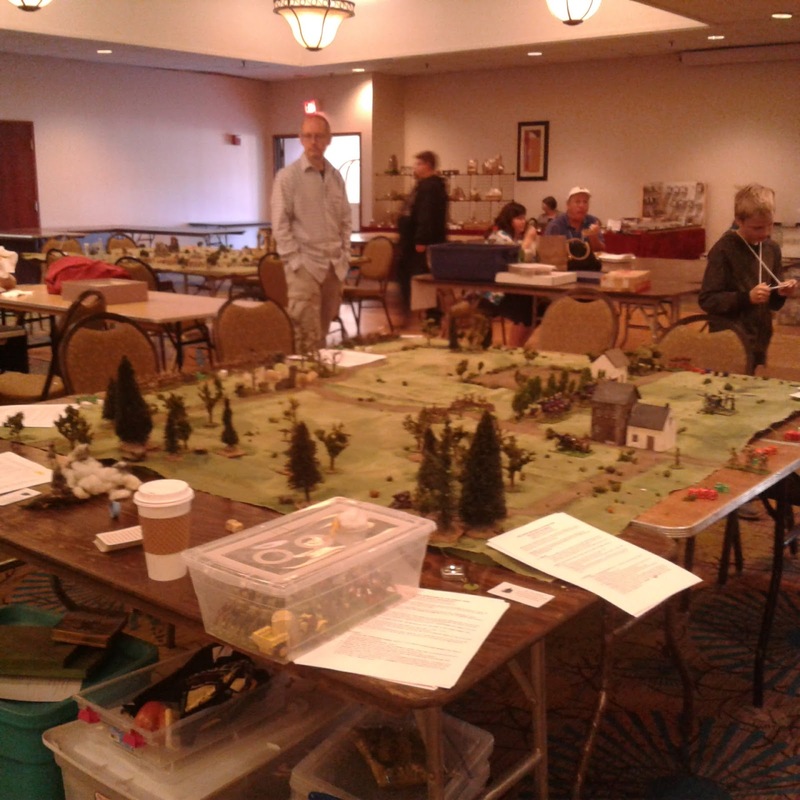 So a BIG thank you to the eight adults (and the two kids) who played in the two sessions of My Grandfather's War. Scruby Foreign Legionnaires waiting for the enemy. One of the things that had given me brain stress in the lead up was the question of how to handle the different way the two sides organized and used their machine guns. Basically, the allies distributed a pair to each battalion while the Germans grouped their machine guns into six gun companies, one attached to each three battalion regiment (giving the same ratio), plus some which were independent companies for various purposes. 2/3 of the way through the 1st game. A prolonged barrage by 2/3 of the German artillery backed by MG and rifle fire have finally cleared the unsupported British infantry from the hill and the Chasseurs have moved over to counter attack the advancing Germans. What I had decided in advance was that the allied MG's would be treated like infantry but have an extra die when firing and have the defensive bonus in melee while the German MG companies would always have a "superior firepower" bonus but would not be allowed to assault and would taken fewer hits. 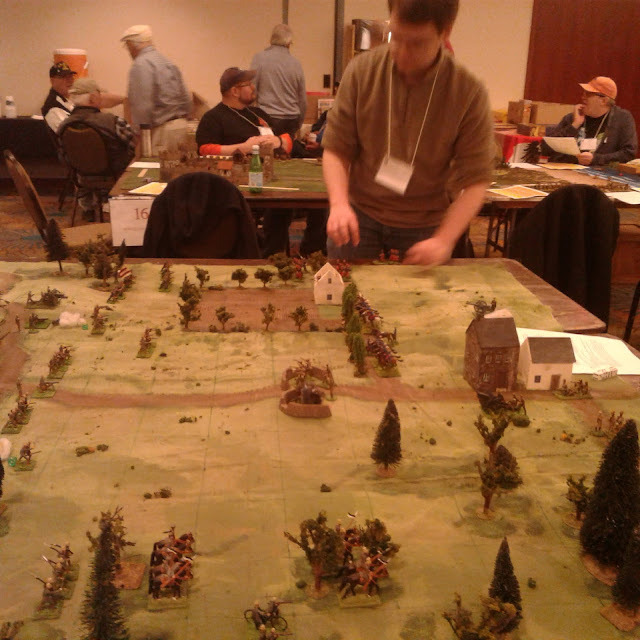 However, by the time I got to the convention I had changed my mind and decided to treat all the MG units on both sides the same as the German units. Partly this was because it would be simpler for 1st time players to grasp but mostly because it seemed to have a more Old School feel which pleased me. Game 1.The end. Robbed of the 2nd last turn by a Joker as a chance card, the Allies lacked time for last ditch counter attack for draw or win. 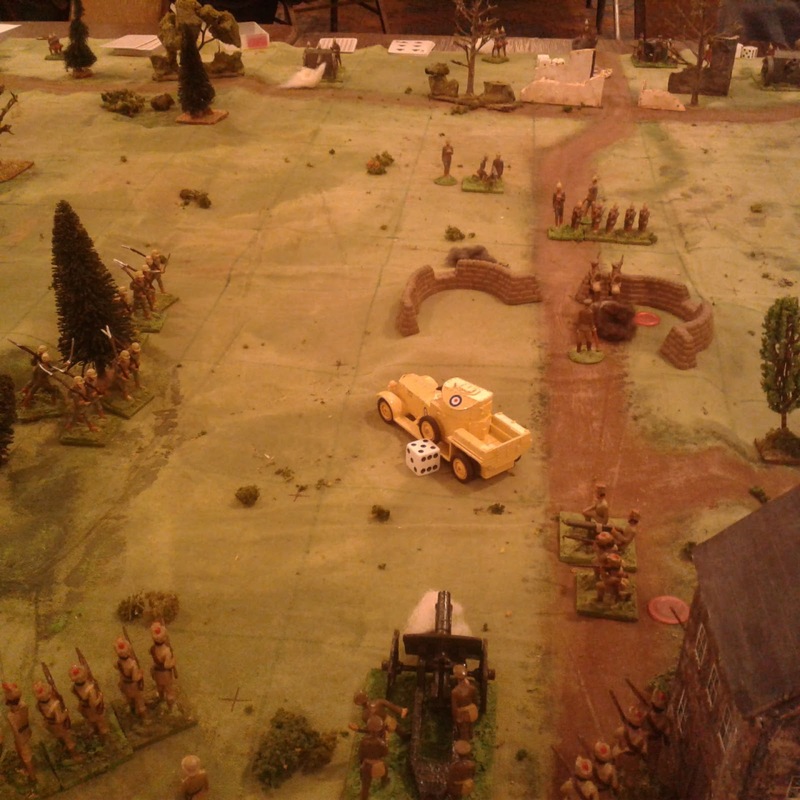 The Germans ended with possession of the Wood, Hill and Farm for 15 pts while the Allies clung to the town for 10 pts. 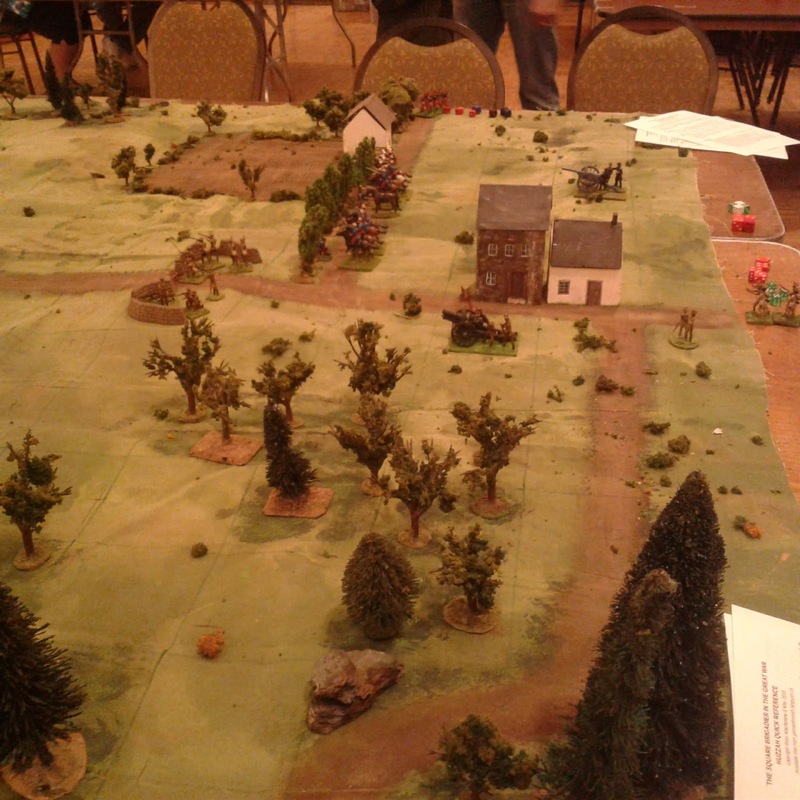 During the two games the MG's had what seemed like just the right effect: deadly but needing infantry support. 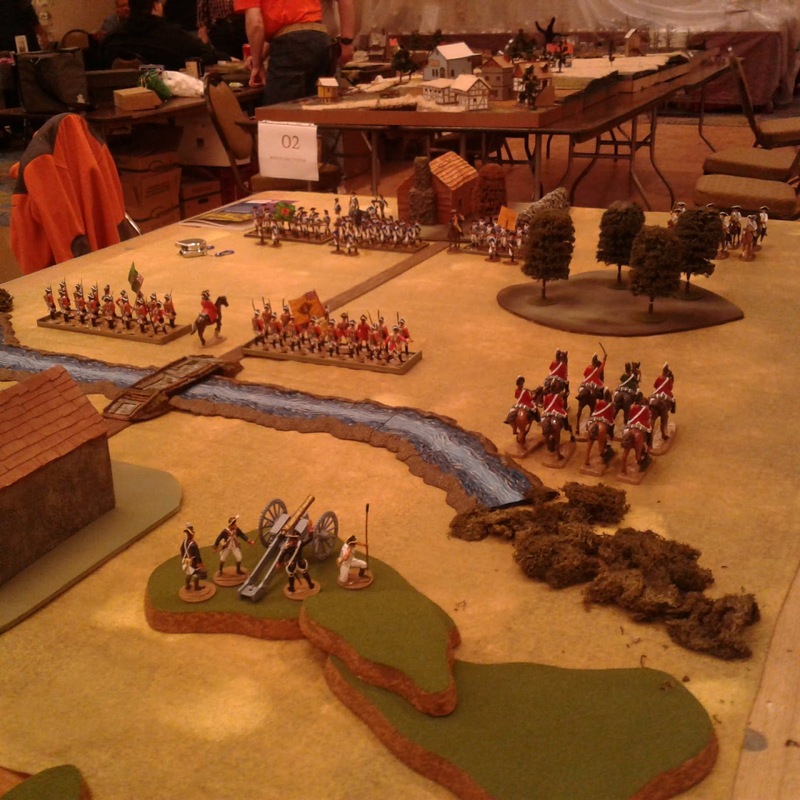 They were particularly effective in the second game when Rob tried throwing rank after rank of infantry into a hail of mg fire and lyddite. On the Allied right, Norman launched the Zouaves into a surprise counter attack with cold steel which swept away some already shot up German infantry but which eventually faltered in a hail of MG bullets as well. I liked the feel of the MG's enough that I am adopting that approach as standard. Towards the end of my pre-game play testing I had decided to change the "-1 die" modifier for artillery changing targets to "artillery must cease fire for a turn when changing target". I then promptly forgot for the first game but remembered for the second game. Over all I prefer the feel of the second approach and its effect on player's decisions. The quicker switching of artillery fire seems more suited to later artillery with radio and telephone communication. I was initially uneasy at the delay when a gun had to switch from indirect fire to point blank fire over open sights at an attacking infantry unit but the infantry had emerged from cover at a very close range and ended up in melee range where the gun was able to fire in self defence anyway. 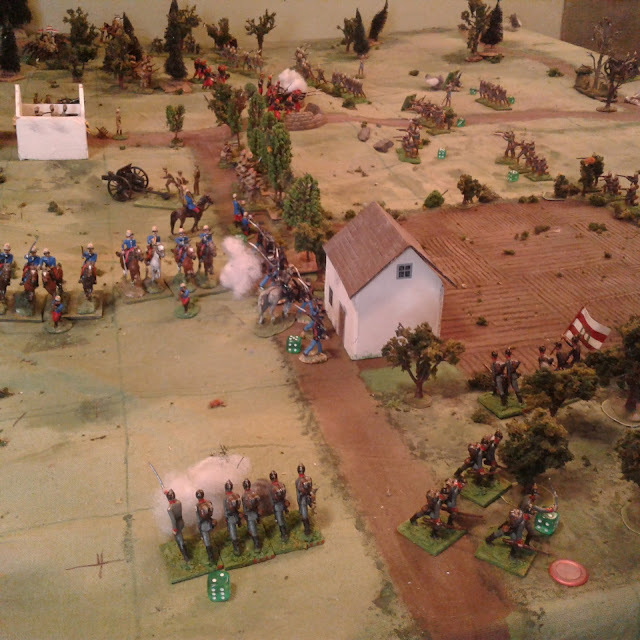 If the infantry had approached in the open there would have been time to switch fire and give the infantry real issues, especially with the Bombardment rule. 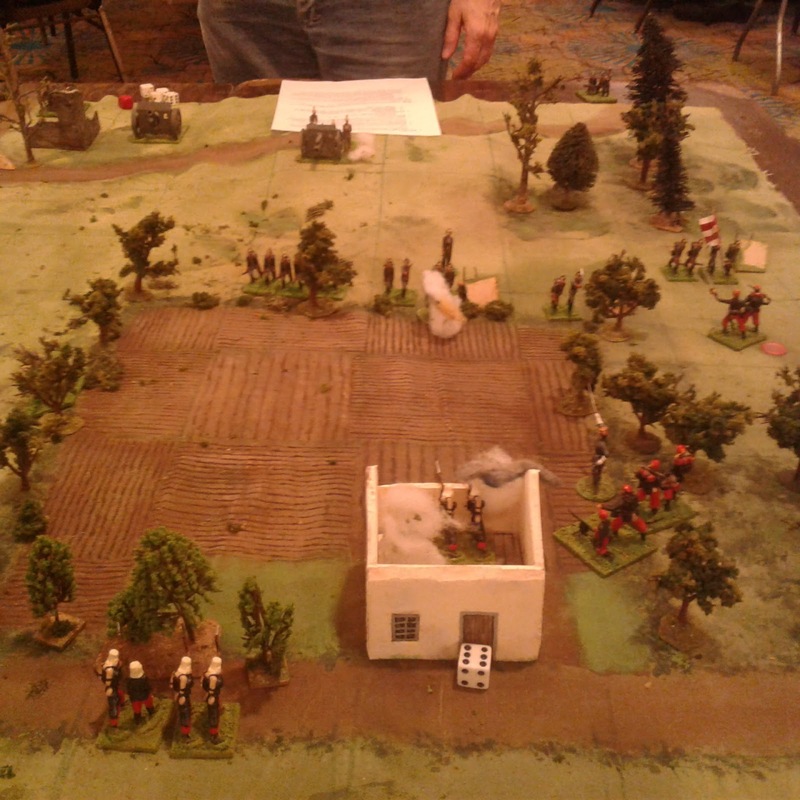 Game 2: The Zouave attack up the right has been stopped by infantry backed by an MG hidden from the camera by a tree at the corner of the field. 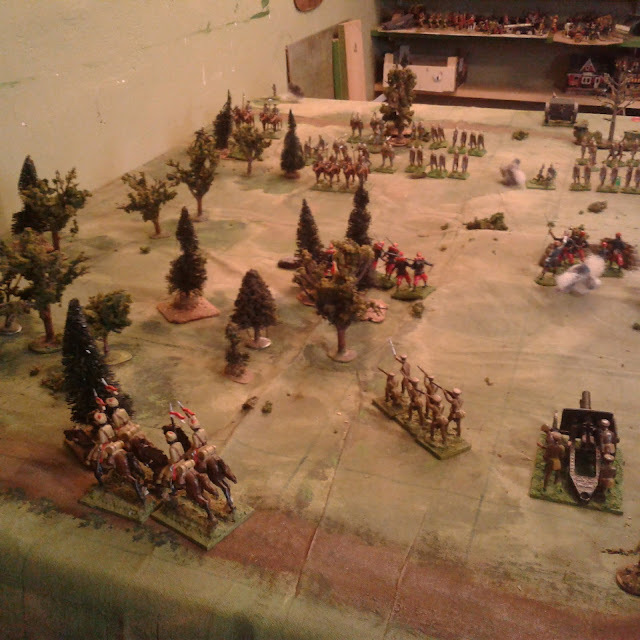 Speaking of the Bombardment rule, which reduces the effect of shooting for units (including artillery) in an area under artillery fire (because they have their heads down) and forces units to test for hits if trying to leave, enter or attack the area, I'm really pleased with how it works as an alternative to a Pin and Rally rule. It now occurs to me that it could well apply to MG fire as well. Game 2 end. The Germans eventually captured the wood and farm but never took the redoubt and have taken absolutely horrendous casualties. I'm not expecting to play many (any) more France 1914 games but luckily both figures and rules will see use in early 20th Century "Colonial" or "Back of Beyond" games in the years to come and the Great Atlantican War is still ongoing. Gratuitous shot of the Cycle Company in action. Next post: What to expect to see on my blog over the next month or two. How was it? In short, every one of the 2,000 kilometres that make up the round trip was worth it. It was a great Con! Three days of looking and playing and discussing and generally talking, and talking. I'd say I'm all talked out but Rob and I have been exchanging notes on next year's Huzzah game so perhaps not quite. Anyway, Gary (my friend and passenger from Nova Scotia) and I arrived at the South Portland Doubletree Hilton on Thursday in time for a late supper with friends Eric and Vicky from Maryland. On Friday the convention doesn't start until after lunch so I volunteered to help with a few minor set up chores after breakfast then got my game set up early. Setting up begins on Friday morning as Gamemasters and Vendors arrive and get to it. 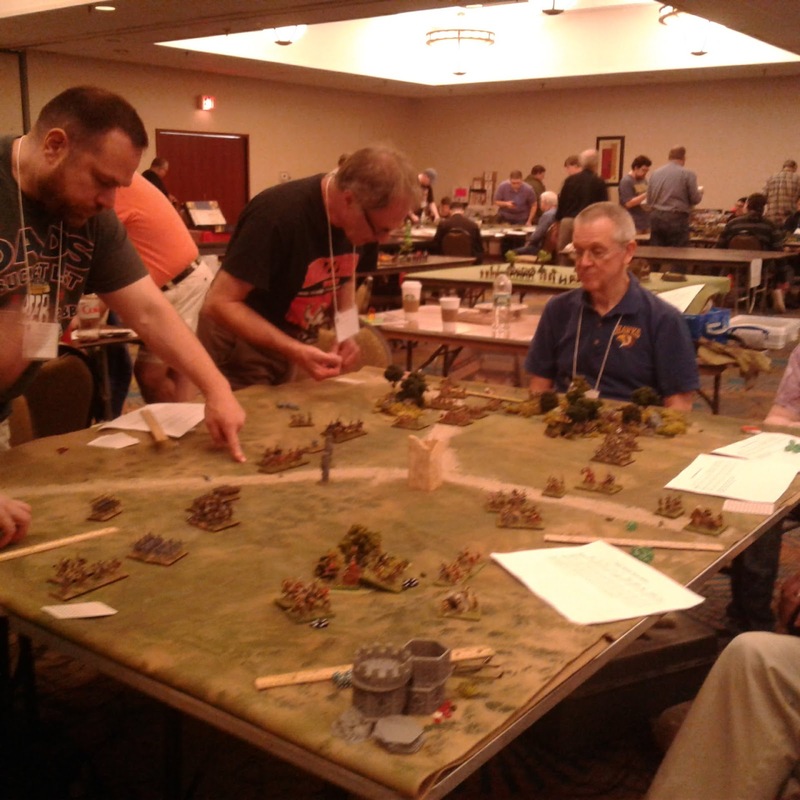 I had a full slate of eight players, mostly friends and acquaintances from past conventions. There were two brothers who were a little short in terms of height and experience but they have played in my games before and their dad has done a good job of raising and 'training' them so the three made a good team controlling the German infantry and artillery (with the occasional bit of coaching from the veteran opposition ). The game was too fast paced for me to keep track of everything that was going on for all 15 turns and 4 hours but it was close fought and not decided until the second last turn. There was an impromptu reprise of the game on Sunday so I'll save the details and my thoughts on the two games for another post. Friday evening had been set apart for Rob and I to get in a test game of our Dragon Rampant event to see how the scenario and armies would work, train me up a bit and make sure we were agreed on how everything works. We were fortunate enough to snag some friends to fill in and make it a 6 player game. 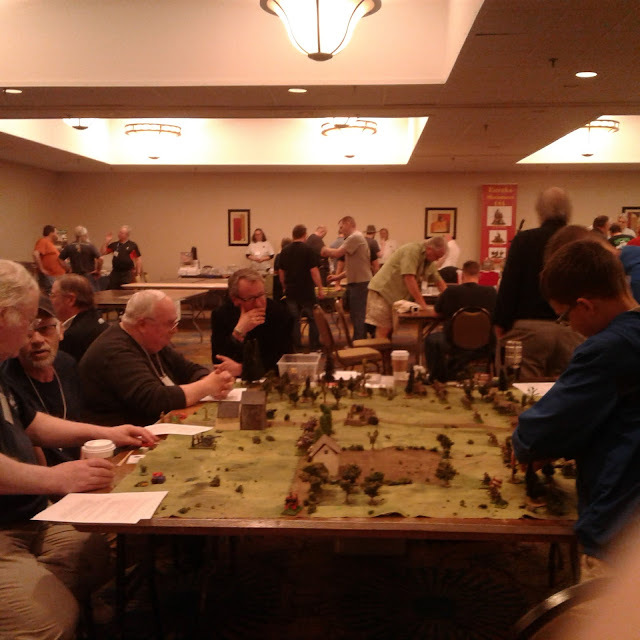 I'm still not really sold on the rules but they worked much better than I expected and I was much more comfortable about our event. 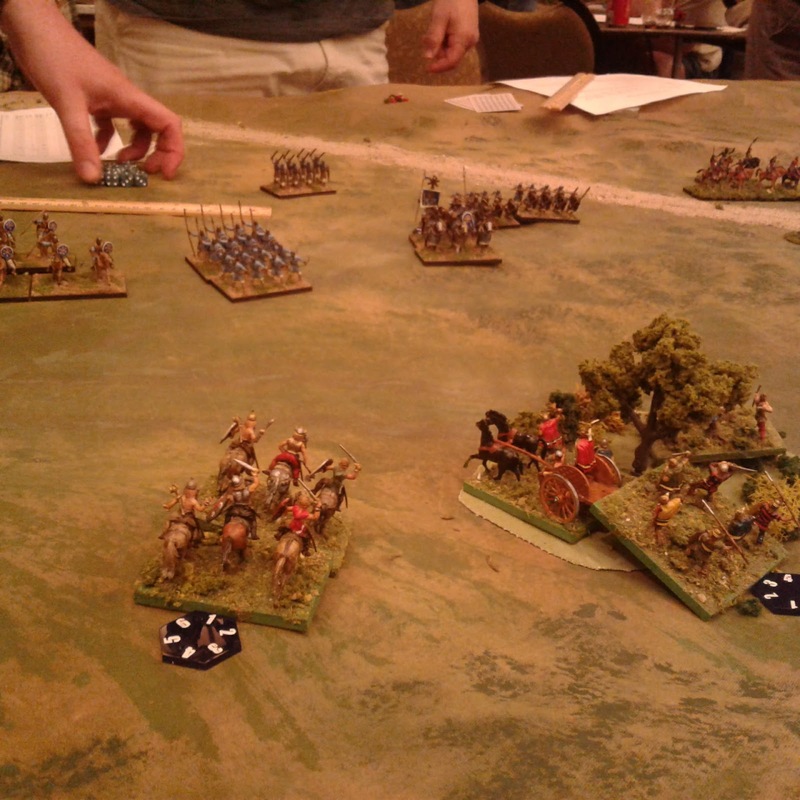 My main worry was that my Black Cauldron army seemed to be less worth its points than the others, especially if it got caught in open ground by cavalry. Saturday morning was the real event and as it turned out we had some "no-show"s so I filled in and took the Black Cauldron force myself. I had originally thought my armies were going to be part of the defending alliance but it turned out we were the attackers. 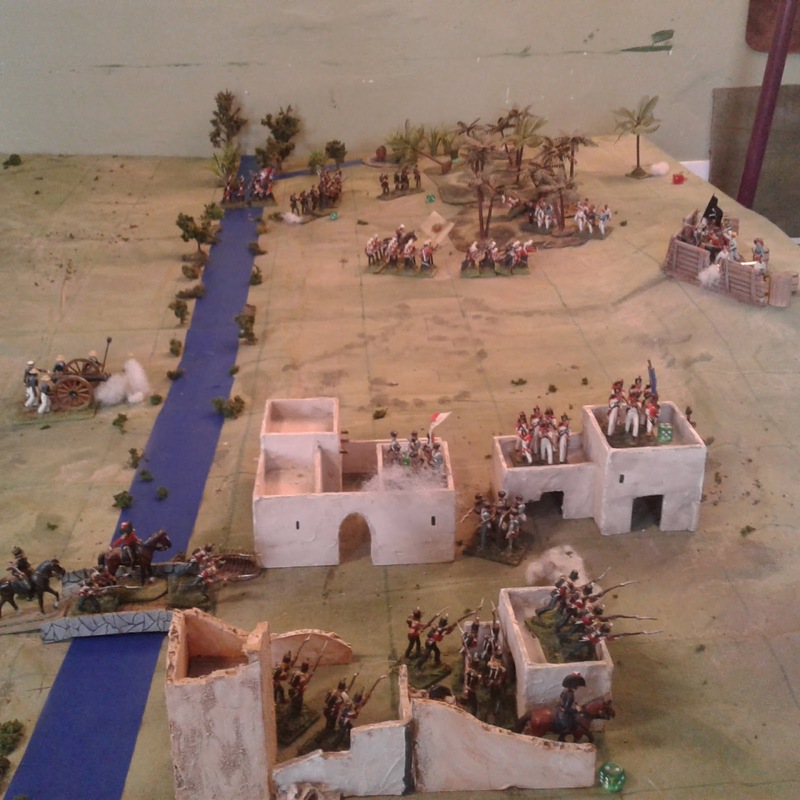 The enemy who was heavy in cavalry and archers were on the defence and immediately launched an all out offensive. Luckily there was a good bunch of people around the table and a pleasant couple of hours were spent before I was crushed completely. 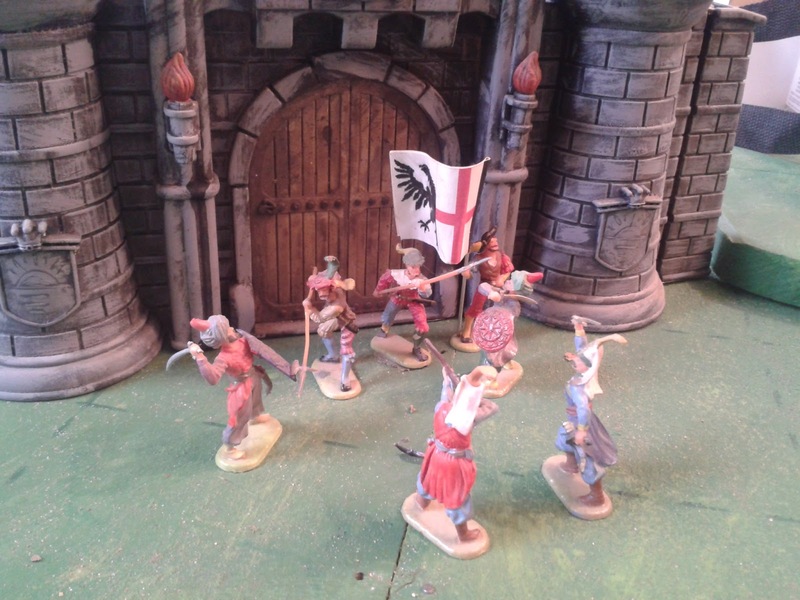 Prometheus in Aspic had donated a small 3D printed fantasy/medieval tower kit to me last fall which I awarded as a prize to my direct opponent who had suffered the least loss and inflicted the most damage of any player in the game. The Queen reviews a few of Gregory' brave soldiers. More nostalgia for my 54mm heyday! Once we cleaned up I was more than ready for lunch but had to stop 2 tables over to see Gregory Arofan's With the Colours in the Late War setup. I just missed the award of the VC to a young fellow playing with his dad. 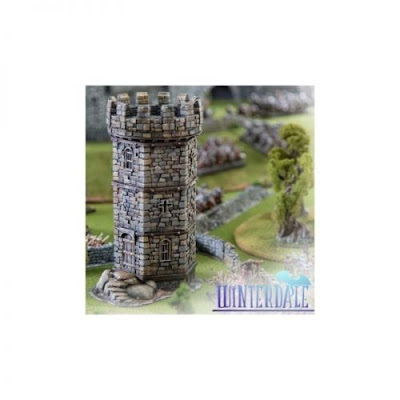 Unfortunately I was tired and hungry and it was time for him to clear the table for the next GM so I didn't get to try it then but we had a good chat and I have the link and a...few toy soldiers so I will give it a go. 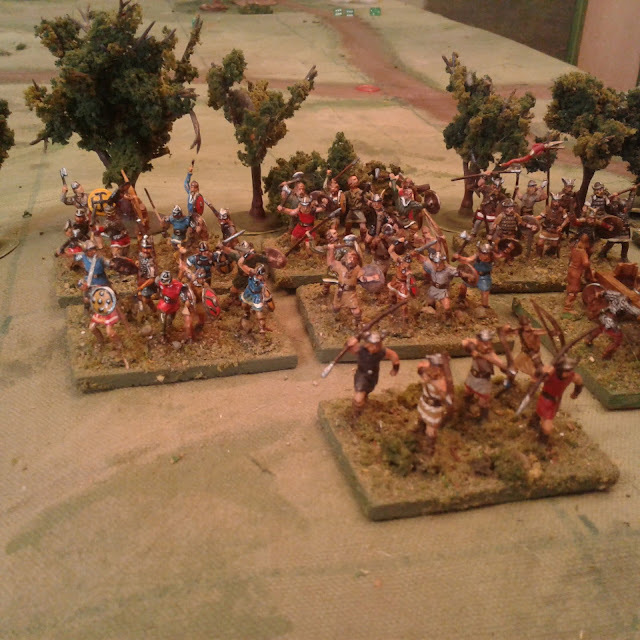 25mm Saxons vs Normans 6 player Lion Rampant game being picked up. Rob was signed up for a Viking/Saxon Lion Rampant game after lunch and I didn't see anything else that tempted me so I checked it out. There were no free spots so I snuck back up to my room for a delightful and much needed nap then came back out to wander around checking out vendors and games and stopping to chat with friends, returning to watch the end of the Viking game. 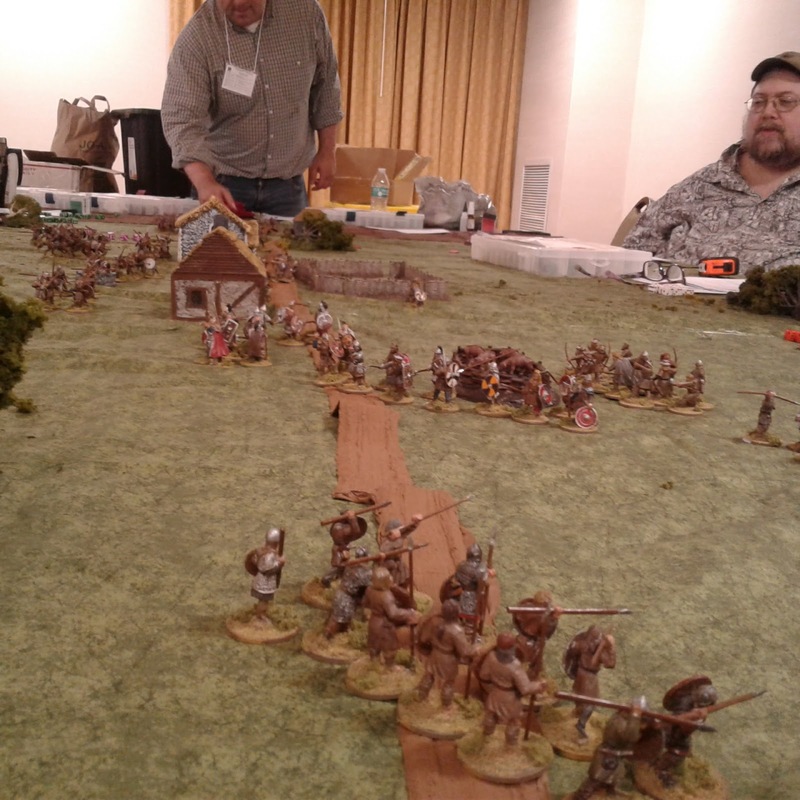 Al Coughlin's AWI game. Ah nostalgia for my 54's! The Brits are largely Accurate, ATKM and Imex. 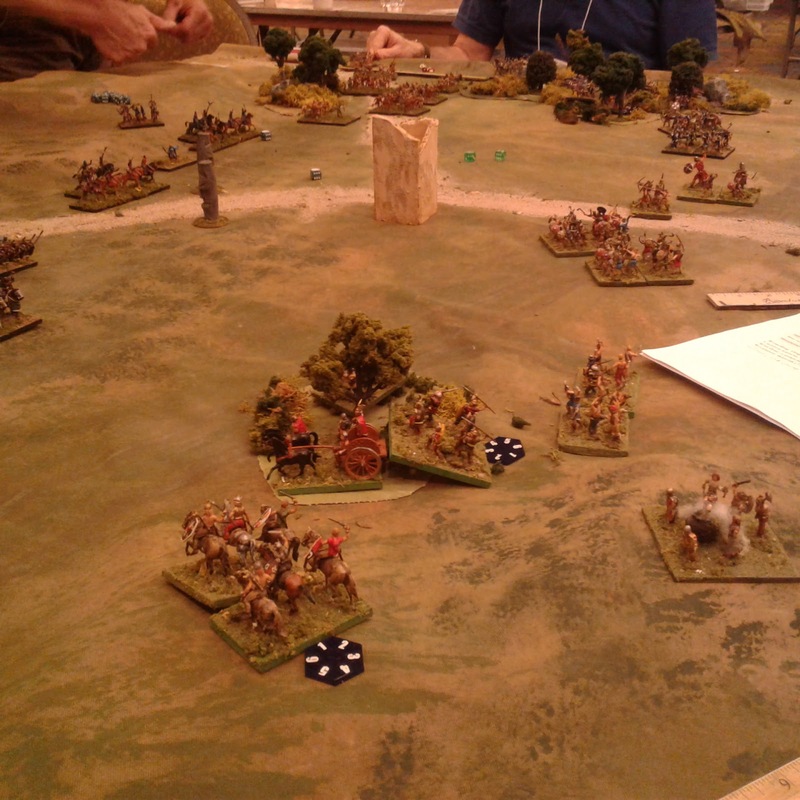 Saturday night I had an invite to help test out Keith Flint's Honours of War using 54mm AWI armies and the introductory scenario. Pushing 54's around a table with friends, rolling dice and talking miniatures and wargaming, how could I resist? I can't really comment on the rules other than that they seem to work but aren't my style. I like long moves, handfuls of dice and a minimum of tables and modifiers. However, it was a most enjoyable evening. The Americans recruited primarily from AIP and ATKM. (OK not really some friends dragged him off into the hills for a pre-planned week's holiday) . One more shot of the 54's for old times sake. These are ATKM cavalry nearest the lens. Good luck to Ken in his new venture and hopefully ATKM will rise again one day. A very small part of the massive Bolt Action Stalingrad. A Trench Raid at night. The B&W painting was amazing! "Cold hearted orb that rules the night, steals the colours from our sight"
Pulp action in Shanghai for all ages. A perennial favourite. Next up a debrief on the WWI games and a look ahead at plans for the next few months now that the sudden WWI distraction is done. A quick snap of an impromptu replay on Sunday. A bit over 500 km after the con yesterday, a bit less to home tomorrow. Today is a rest and family day. I wish I could promise a full, heavily illustrated report once I get home but I'm afraid that for 3 days I was so busy either playing, GM'ing, talking with friends and generally enjoying myself, that pictures were few and memory a bit blurry but I'll share what I've got! 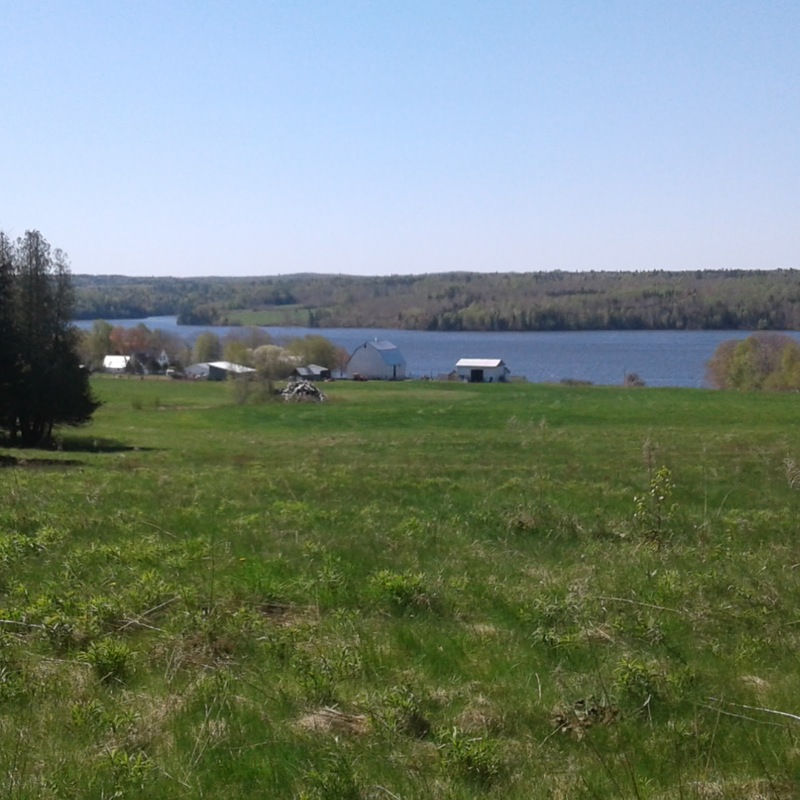 Overlooking the Saint John River and my "halfway house". 1/2 day and a drive to go. 1,000 kilometer march with a battle at the end. Issue the men a double tot of .. ummh strike that, have the cook issue the men an extra coffee. For those interested in the lighter sides of miniature wargaming, I've just posted a report of the first test game for the two 1/72nd fantasy armies that I am bringing down to Huzzah as my contribution to Rob Dean's six player Dragon Rampant game which I am assisting in. 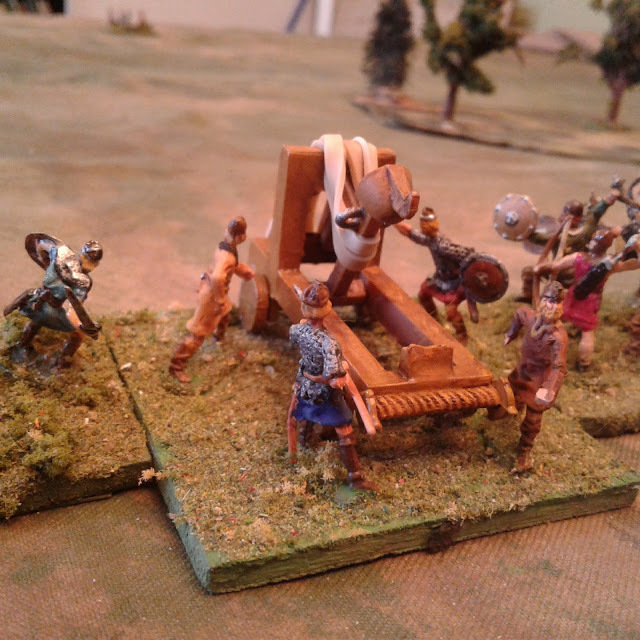 This catapult came in one of my best Christmas presents EVER, a 25mm, handpainted, hard plastic, MARX Knights and Vikings castle playset. I put a new elastic on it and it'll still shoot a missile across the room. As a bonus, this army includes some of the Orion 1/72nd copies of the Marx 25mm vikings (see below) so the catapult feels right at home. and the British battalion has even got its own MG at last! 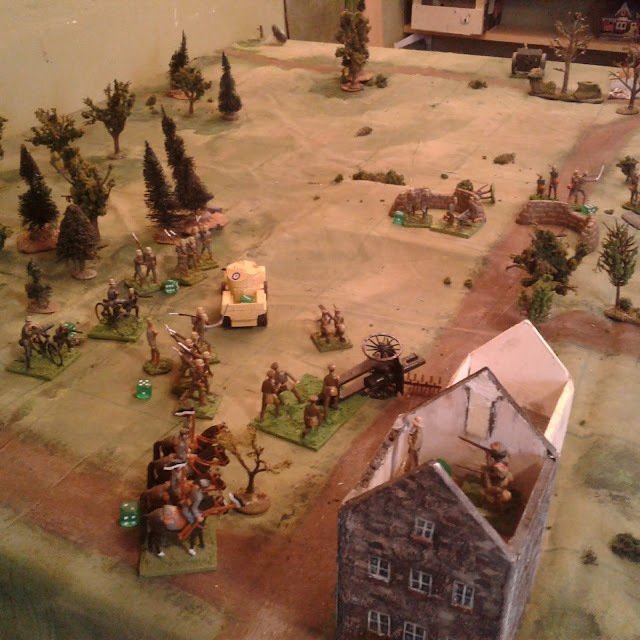 The Germans have double the number of infantry companies and the support of that field kitchen but the quantity of artillery and machine guns is equal and the Allies have a slight edge in cavalry, not to mention the armoured car, but only 1/2 the Allied units begin on the table. I don't think it'll be easy for either side. 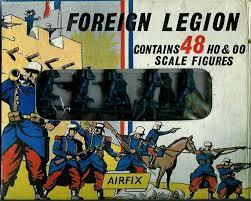 The hoped for box (car) of recruits for the Foreign Legion arrived today and went straight into training. 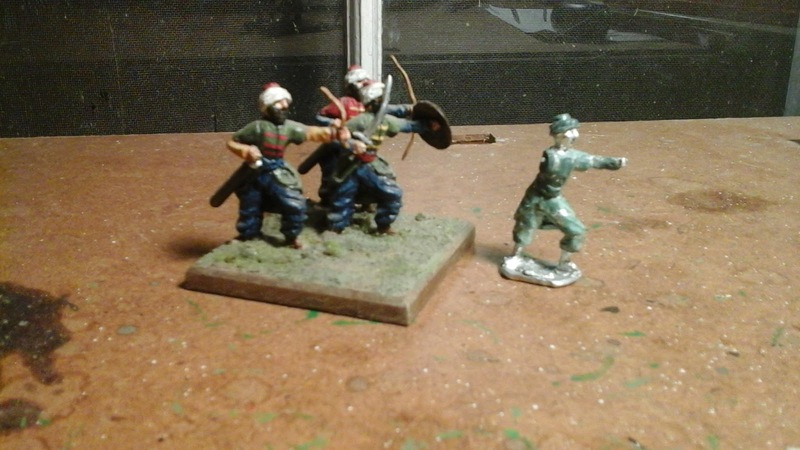 Scruby 40mm from Historifigs. Primed with Burnt Sienna mixed with a bit of matte varnish. I find this works well under red. Now if these were Model Soldiers, for France 1914 I'd have to consider whether or not the pants should be white and if the havelock was appropriate but since they are toy soldiers I can just go to the ultimate authority on what the Foreign Legion should look like. The original Airfix box art. A bottle of my mother's nail polish supplied the red trousers for my first box. Six days and a wake up left. Over view as the game gets under way. The US infantry near the white house are just filling in for now. It was a tremendous struggle. The fight over the rules I mean, not the game although it was hard fought and close as well. The idea, ever since getting hooked on Morschauser in 2003, has been to keep the rules results based rather than the process based approach I had been used to for the 30 years preceding that. It seems that my subconscious mind has yet to fully surrender on the issue though, despite being shown time and time again that the results based approach ends up giving me, not just a more interesting game, but also one where the tactics and results more closely resemble my reading. The British are coming! The British are....HERE! In the case of late 19th/ early 20th wargames, my mind wants to see an explicit rule for "pinning" amongst other things but getting an effective rules with the right feel and effect has proved elusive for a long time. Time and again, experience has shown me that dumping the various explicit "pin" rules always gets me closer to the right feel but with a more interesting flow and more player choices to make. In essence, troops in the open which come under fire have two options if they are attacking: return fire or advance. Advancing can work, as it sometimes does in life, as long as the distance is short and the quantity of fire not excessive but it will tend to be costly and there is a strong risk that an assault against an untouched enemy will fail. The alternative is to lay down, return fire and call for artillery or for a friend to flank the enemy while you keep them occupied. These things aren't specified, they just work that way if you think about it or experience it. 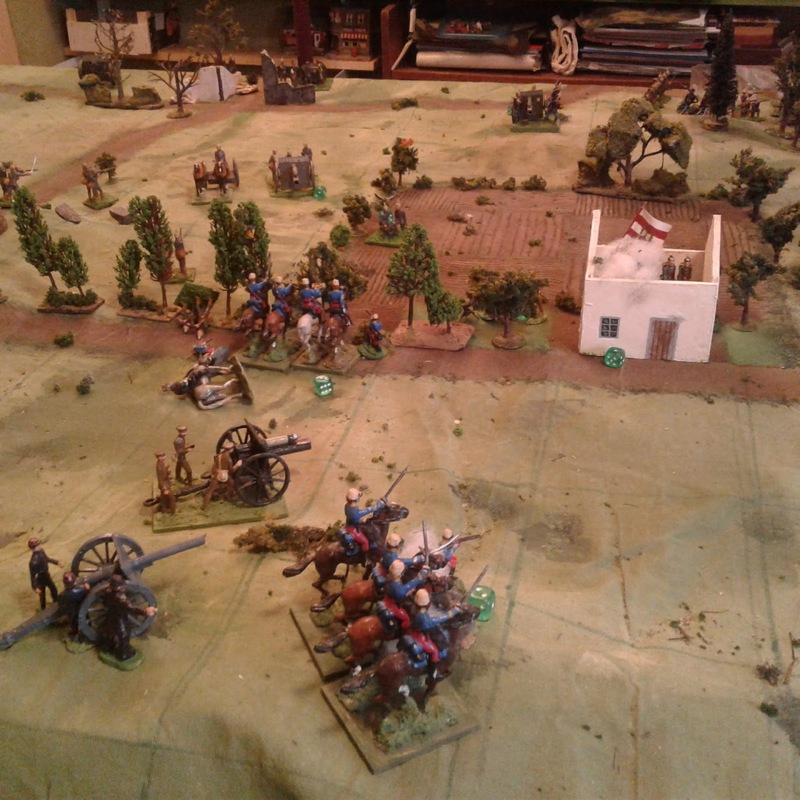 The Germans turn the Allied right flank. The other silly thing I've had to contend with over the last 2 weeks is a strong urge to increase the firepower of units because I increased their strength. It took several tries before the obvious finally sank in that increasing potential hits that a unit can inflict in the same ratio as I increased the number of hits it can sustain, meant little change on the tabletop. No matter how much it rubbed me the wrong way, to get the effect I wanted without complicating everything, I needed to increase the number of hits that a unit can take without changing the maximum number of hits that it can inflict in one turn. 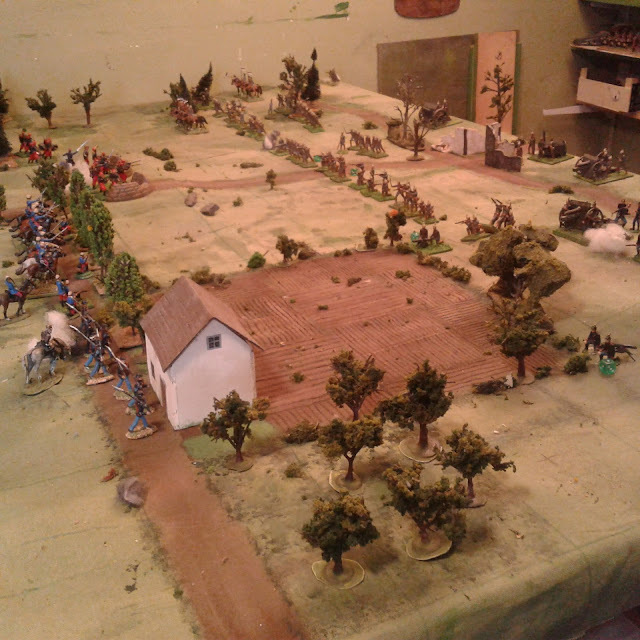 End Game: to everyone's surprise the French cavalry are still holding the line but the farm has been lost to the Germans. On the other flank, the hill redoubt was lost, retaken and lost again along with the woods. The Allies get 2 VP for the town but the Germans have 3 for the rest. An 11th hour victory. This time two weeks from today, it will all be over!